Budd-apest, a city in the foothills of the Rakath mountains between Sultan’s Gate and Qarkura, is rich in Kaliphlinian history. Many decades ago the monks of Cedrica had proclaimed the need for a crusade to make holy the creatures of Nocturnus. Many minor lords saw this as an opportunity to claim new land in the name of the crusade. The forces gathered and marched for Nocturnus. They planned to travel through the Rakath mountains but found the way blocked by the Kelra Labyrinths. Many tried to brave the Labyrinth and were never seen again. Others headed south to attempt to cross the mountains closer to the Kaliphlin border. Few made it through the harsh mountains and those who did found the inhabitants less than happy about their reason for being in Nocturnus. The monks heralded the men as brave souls, but agreed that the venture should not be attempted again any time soon. A small band of these crusaders, as they headed south to avoid the Labyrinth, found themselves caught in a fierce sand storm. The sand storm raged for days and the small group of travelers found themselves thoroughly lost. They eventually found themselves at the Sultan’s Gate and, assuming they were still heading towards Nocturnus, climbed the path up the cliff. The traders at the top were more than happy to sell the weary travelers provisions at a marked up price and to direct them further into Kaliphlin knowing the next traders would be able to profit as much as they had from these crusaders. It wasn’t until the crusaders arrived at the little city of Budd-apest that someone honest told them how far from their destination they were. The travelers were broke and exhausted. Having pity on them, some of the town leaders opened their homes to the foreigners. The monks among the troop shared their beliefs in the sect known as the Way. Many natives of Budd-apest believed the monks and accepted their faith as their own. The knights among the crusaders saw first hand that sharing their beliefs through peace was far more effective than through conquest. So when a band of raiders attacked the city, these knights placed themselves in the front lines of the city’s defense. After their successful victory the Sultan gave all of the knights the honorary title of “The Red Guard” and told them they would always be welcome in Budd-apest. A few of the band decided to leave for home, but most of the troop stayed. A compound was built housing a church, barracks, and a few other buildings. The monks made it a welcoming place and the knights made it a place of safety. In Budd-apest today many of the original crusaders still live in the compound. New converts have joined their ranks, some opting to join the monks and others the knights. The city itself is divided between followers of the Way and the other predominate religion in the city, followers of the Destroyer. After the favor shown to the crusaders in allowing them to have the Red Guard, the leaders of the Destroyer sect demanded equal privilege. They formed a group known as the Masketeers because of their use of masks. The Red Guard and the Masketeers did not like each other, but they tolerated one another because they knew in-fighting would only cause problems for the city they loved instead of solving its problems. As war began in Kaliphlin, it was no secret that Budd-apest supported the Desert King. They knew that without the leadership of the Pharaoh all those years ago, Kaliphlin would probably be ruled by the Drow. They also knew that the Ulander’s promises were too lofty for them to actually keep. Promising the throne to Mitgardia alone proved that they didn’t know how things worked in Historica and that they were only interested in their own devices. Mitgardians were too focused on events within their own borders to care about ruling all 4 guilds. As for the council, they fought more than they accomplished anything of benefit. The Desert King was the obvious choice for the people of the city. The Desert King, knowing of the opportunity for alliance with Budd-apest, sent some of his eastern-mountain mummies to parlay with the city. Eastern-Mountain mummies are very different from desert or regular mountain mummies, preferring to use the katana over the khopesh. When the Desert King ruled, he was over those who used both the khopesh and the katana so when he rose, the eastern-mountain mummies heard his call and answered the same as their desert brothers. 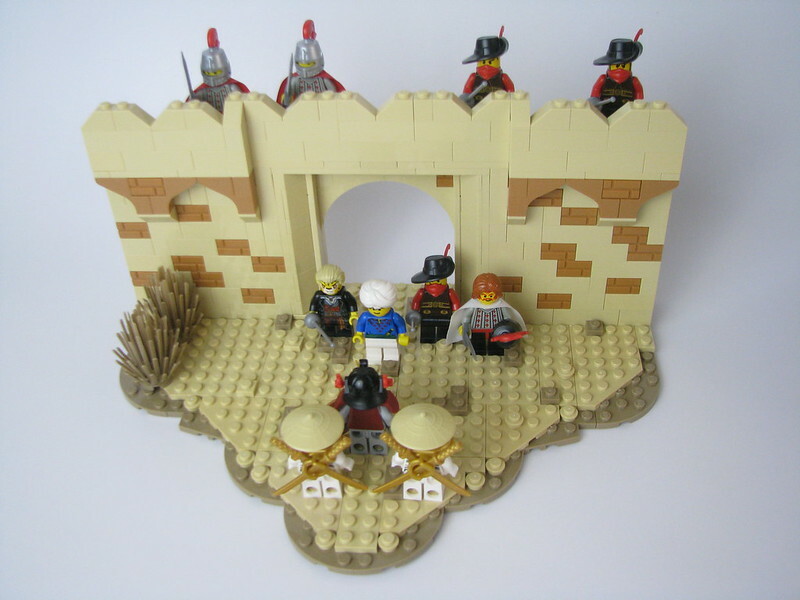 The Sultan, with representatives from the Red Guard, the Masketeers, and a half-Leander known as Charlemagne meet with the mummies at one of the city’s gates. The Sultan was agreeing to assist the Desert King with both supplies and men when an assassin attacked. Charlemagne was too quick for the assassin though, and dispatched him with ease. A note was found in the assassin’s pocket with details of a meeting of soldiers with plans to attack the Desert King's forces. A plan was quickly put into place for the men from Budd-apest to prove their worth to the Desert King. They marched out to meet the soldiers and managed to take most of them prisoner with minimal casualties. It was unclear whether these men were from the High Council or from Ulandas for none of them would talk. But the Sultan of Budd-apest knew that the prisoners would come in handy eventually. And as an added benefit his men had proven their worth to the Desert King. Nice work! 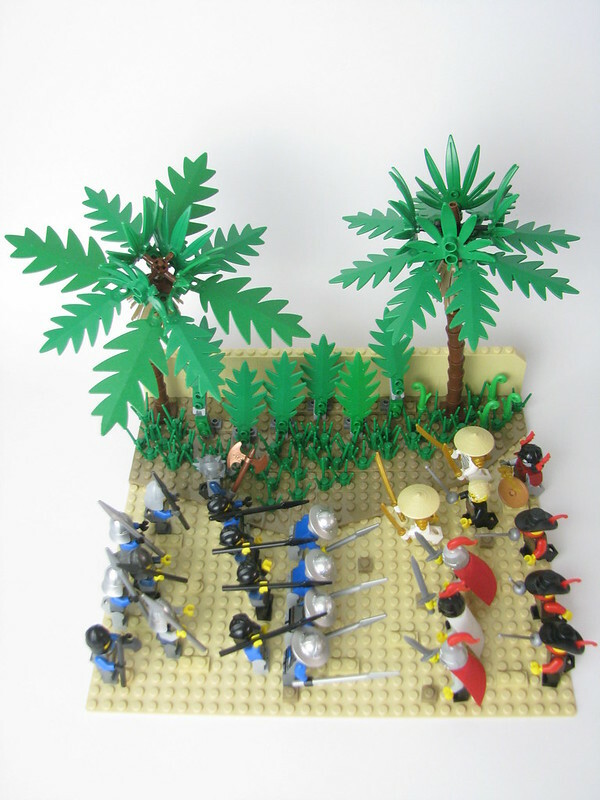 The Red Guard, mummy, and musketeer figs all look great, and so does that cool Palm tree!! Awesome! 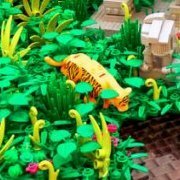 Great figs and builds to go along with it! Very efficient use of parts for both the wall and the palmtree. I definitely like the overall atmosphere of the build a lot. Also great job on having the minifigs from Budd-apest run at their foes, the placements looks really dynamic. Both builds look very good. I like the shape of the irregular base in the first MOC, and the dark flesh works nicely in the wall.